This photo finds me stopped along the trail where I am brewing a cup of tea with water melted from snow. Of course that is not the best way to economize the use of the fuel canister powering my packstove. However knowing that I would only be out for the day, I ran with it. Besides, I didn't have too carry the water for tea that way. Still, I do have various emergency items with me in my daypack, including the necessities for starting a fire under emergency conditions if required. While enjoying the cup of tea brewed from real tea leaves, I'm checking out what activity there is on the APRS network, as I have my Kenwood D72 along with me. In actuality I was out checking out my new snowshoes that replaced the old set I had and were due for replacement. 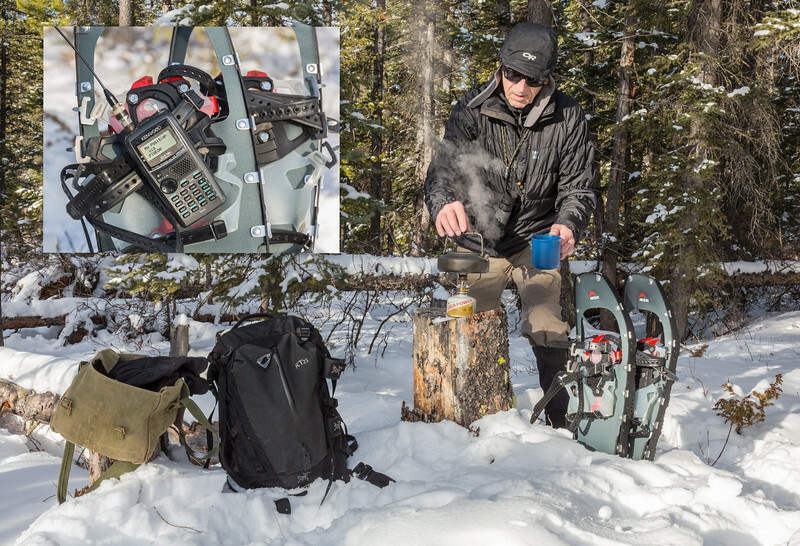 I don't know how much snowshoeing you do, but depending on the terrain you are snowshoeing in, or plan on making tracks in, its important that you put some thought into the snowshoes you select. On flat terrain like out on the plains its not as critical other than the size of snowshoe you choose based on the amount of snow you will be snowshoeing through, and the flotation you will need. Now snowshoeing in the mountains, and particularly in the backcountry and on rougher terrain, you need snowshoes with better bindings, and you'll also want a pair that have a more aggressive cleating system. My last pair of snowshoes were not up to the standards that I wished they met, so I went looking for a new pair. When the dust settled (snow!) I came away with a pair of MSR (Mountain Safety Researchh) Lightning Ascents in a 25" length that have optional tails available if the snow conditions demand a larger snowshoe. They feature decking made from ballistic nylon, with 360-degree traction frames that provide grip on whatever terrain you find yourself on. The PosiLock AT bindings combine with Torsion2 crampons for excellent support and traction. Heel-risers ensure that you won't suffer from undue fatigue when encountering steep terrain. The MSR Lightning Ascents are as light as snowshoes get, built from lightweight hi-tensile aircraft-grade aluminum, and they are a breath of fresh air when compared to my old pair when it comes to the difference in weight, never mind all the other features. After a day out playing in the snow, I know I made the right choice. Well.....the tea break is done, time to saddle up, or at least get back in to my snowshoes and hit the trail.